Pet Education: My Dog Bit Someone. Do I Have to Euthanize Him? Is your dog a danger to society? In short yes. But that goes for any dog. Dr Patricia McConnell says that any dog who can open and close his mouth can bite. It doesn't matter if the dog has never bitten before. There is a first time for everything. If your dog has bitten before, is she likely to bite again? If the dog has learned that biting works, then yes, the dog is likely to bite again. What do I mean by "learned that biting works"? Most dogs do not want to bite. They only resort to biting as a last resort after all of their other communications have been ignored or punished. Experts tells us about a "ladder of aggression" - when dogs are uncomfortable in a situation, they might start with lip licks or yawns or darting eyes. If those calming signals are ignored, a dog might move on to stares or stiffening. If that is ignored, a dog might growl or snap. If that is ignored or punished then the dog might feel that only other option is biting. So once a dog learns that biting makes the scary thing stop happening (like a stranger approaching or a little child hugging him), the dog might go straight to biting at the next scary encounter. I have not watched this video, but experts say that the "Show Down With Holly" video shows some good examples of a dog's calming signals being ignored. You can probably find it by searching Google or Youtube. 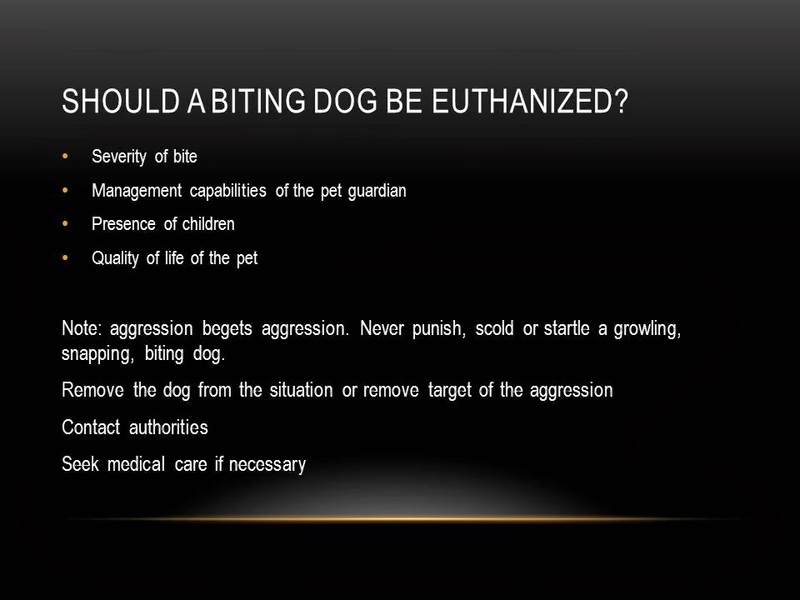 Does a biting dog need to be put to sleep? It depends on a number of factors. The dog's quality of life, the ability of the owner to manage the situation, the presence of children, etc..
One of the determinations is how much damage was done. Ian Dunbar writes about "bite inhbition". Some dogs bite hard, some do not. According to his research, a dog who bites at a low intensity would probably bite at a low intensity if pushed into biting again. A dog who does a lot of damage would probably do so again if pushed into biting. Dunbar states that in some ways a dog who has bitten multiple times and caused no harm can be safer than a who has never bitten. Because we don't know the latter dog's level of bite inhibition. Of course this doesn't mean that we should harass or frighten a dog who does little damage when biting. We could escalate things. And not all dogs are going to fit the research mold. Dunbar created a dog bite scale. Level one is the least serious - "aggression" with no biting. Other factors to consider when a dog bites - the skin of children and the elderly is a lot more tender. A bite that might be harmless on a middle aged man wearing blue jeans might cause serious damage to a baby's exposed skin. Do you have questions about dog bites or aggression? Send them to us in the comments section below. Pet parents should always consult a competent professional if their dog has bitten or might bite. Normally the local authorities should be called in any bite situation and the person bitten should seek medical care. Labels: dog aggression, dog bites, dog ladder of aggression, ian dunbar bite scale.